Helicopter blades withstand tremendous stresses. In addition to supporting the weight of a helicopter, they are spun at rapid rates and experience large centripetal accelerations, especially at the tip. Calculate the magnitude of the centripetal acceleration at the tip of a 4.00 m long helicopter blade that rotates at 300 rev/min. 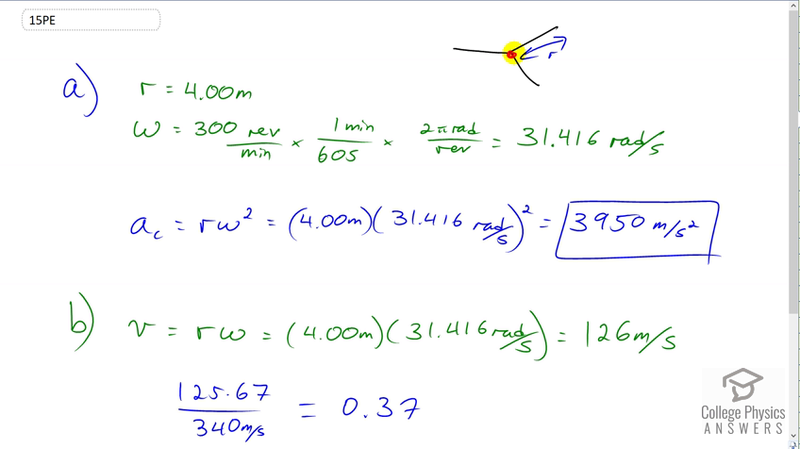 Compare the linear speed of the tip with the speed of sound (taken to be 340 m/s). This is College Physics Answers with Shaun Dychko. A helicopter blade is 4 meters long and this blade is the radius because the blade is connected at the center of the rotor to the perimeter. We're told the angular velocity is 300 revolutions per minute which we'll convert into radians per second in order to use it in our centripetal acceleration formula. So we multiply by one minute for every 60 seconds and the minutes cancel, and then we'll multiply by two pi radians in every revolution. We end up with 31.416 radians per second. So the centripetal acceleration is the radius multiplied by the angular velocity squared. So that's 4 meters times 31.416 radians per second squared giving us 3950 meters per second squared. Now, the linear speed of the tip of the blade is going to be its radius times its angular speed. So that's 4 meters times 31.416 radians per second which is 126 meters per second. We're asked to find you know, what is this compared to the speed of sound and so we'll divide the two. 125.67 meters per second divided by the speed of sound, 340 meters per second which gives 0.37. That means the speed of the tip of the helicopter rotor is 37% of the speed of sound. Now if the tip was greater than the speed of sound, the rotor would be very loud because anything that breaks the sound barrier makes a, you know, sonic boom. This is actually why a whip is loud. When somebody cracks the whip the cracking sound comes from the tip of the whip going faster than the speed of sound for a moment. You can also get the same effect from snapping a towel.